Retin-A is a topical skin medication that contains the active ingredients retinoic acid and tretinoin. When applied to the skin--either in cream or gel form--the cream acts as a mild chemical peel, stimulating cell turnover and boosting collagen production, which makes the skin more supple. Because Retin-A is similar to a chemical peel, its application can leave the skin red or dry. For this reason, many people consider if it would be beneficial, or even harmful, to further abrade the skin. For patients using Retin-A products, the active ingredients work to slough dead skin cells and renew the cells underneath. This acts as a natural exfoliation process to turn cells over. When Retin-A is first applied, the ingredients may first cause breakouts, dryness and redness. However, after this time, the skin should appear smoother, softer and less prone to breakouts. During the first 2 weeks, it is a good idea not to exfoliate your skin in order to avoid further irritation. After this 2-week period has passed, your skin should appear less red or dry, and may benefit from exfoliation. However, there are a wide variety of exfoliation options, and some may be more abrasive than others. Exfoliators that are more abrasive are made of ingredients such as apricot kernels, walnut shells and pumice stones. Each of these consists of irregularly shaped edges that can effect delicate capillaries on the face, causing redness and even a bruised appearance. Exfoliator ingredients that are more mild to the skin include jojoba, which is a natural exfoliator and is regular in shape. Other exfoliators that contain enzymes, such as papain, are less irritating to the skin, as they also soften as they exfoliate. Mid-level exfoliators that can be irritating, but less so than the above-mentioned products include alpha hydroxy acids or beta hydroxy acids, both of which have been shown to irritate delicate or sensitive skin. When it comes to skin in which Retin-A is also used, it is a good idea to begin by using the milder exfoliators, then working your way up to the more irritating ingredients if you do not see the desired results. Another option is to utilize a soft washcloth or even an exfoliating glove made especially for the face. It is possible to overexfoliate, meaning you place too much stress on the skin, which causes it to appear less moisturized and more red. Exfoliate no more than twice a week. If your skin continues to be increasingly damaged, dry or painful following exfoliation, it may be a good idea to cease exfoliating while using Retin-A. 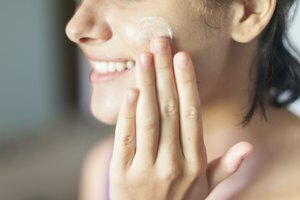 A dermatologist also may recommend a moisturizer for sensitive skin that won't irritate or dry out your skin and may provide some relief following exfoliation. What Are the Differences Between Clay & Mud Masks?